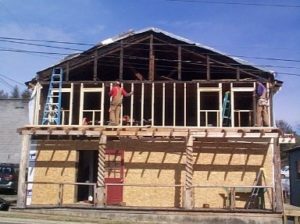 The modest, but well-constructed building known by various names, beginning with “the Blevins Building,” has served the Town of Bakersville and its people for decades. The name by which locals often call the structure comes from original owner Ed Blevins, who grew up in the white house (in the immediate background) owned by Alice Blevins. The Blevins Building was built soon after the 1901 flood and replaced a barn on that property. It was first used for storing seed, feed, and fertilizer. 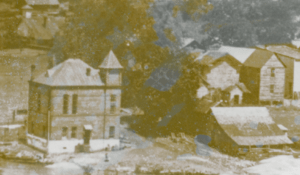 This photo was made after 1907 when the new courthouse was constructed. In the early 1920’s, it served as a silent movie house operated by J.B. Craigmiles, editor of the Mitchell County Banner; he also operated the player piano for the movies. 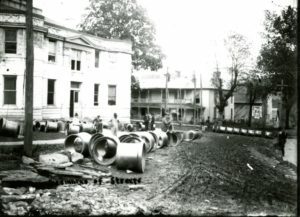 Note the movie poster on the side of the building taken about 1922 when the first sewer system was put in. 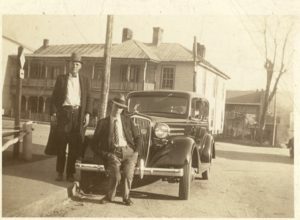 During the 1930’s it housed a bowling alley as seen in this photo. Other occupants included Graham’s Furniture Store in the 1950’s and Will McKinney’s Pool Room in the early 1960’s. For a number of years, it remained unoccupied. In the 1970’s it was remodeled and provided space for a food co-op and a model railroad display. 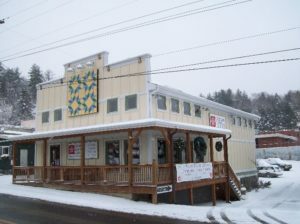 David Trophia and John Lara purchased the building in the 1990’s, along with the building beside it, in which they opened a jewelry and crafts studio and gallery. Together they totally upgraded its support structure and remodeled the building, keeping the character of the original inside. It became the home for a world class fine arts gallery which attracted visitors from around the state, nation, and world. The Crimson Laurel Gallery had a significantly positive economic and cultural impact on the town of Bakersville as well as Mitchell County.